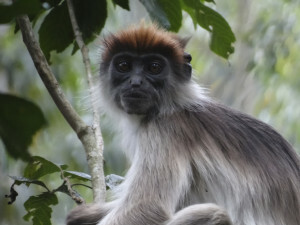 A red colobus monkey in Kibale National Park, Uganda. Some of the most common parasitic infections in wildlife are caused by intestinal worms. Unlike bacterial or viral infections, however, worm infections rarely lead to death, and may not even cause overt clinical symptoms. In this research, we investigated the potentially nuanced effects that whipworm infection could have on wild red colobus monkeys. Our results show that infected red colobus favored resting over more energetic behaviours. They also consumed potentially medicinal plant parts like bark. These results suggest that while worm infections may not kill, they may cause behavioural changes that indicate their presence in wildlife are not without consequence. Sickness behaviour associated with non-lethal infections in wild primates.